Akhurst Machinery recently hosted an open house to showcase their new facility in Mississauga, Ont. Cutting the ribbon, front and centre, were: Ryan Akhurst, vice-president; Eric Stebner, president; and Graham Akhurst, vice-president. Akhurst Machinery recently hosted an open house to showcase their new facility in Mississauga, Ont. The 18,000 sq. ft. building features a state-of-the art, fully operational showroom. During the two-day event, dozens of woodworkers were able to view live demonstrations on a wide range of equipment including Omnitech CNC routers, Altendorf sliding table saws, Gannomat dowel construction machines, Bi-Matic & Cantek edgebanders, Heesemann widebelt sanders as well as products from Doucet, Italpresse, Striebig, Tigerstop, Sawstop, Original Saw, and more. 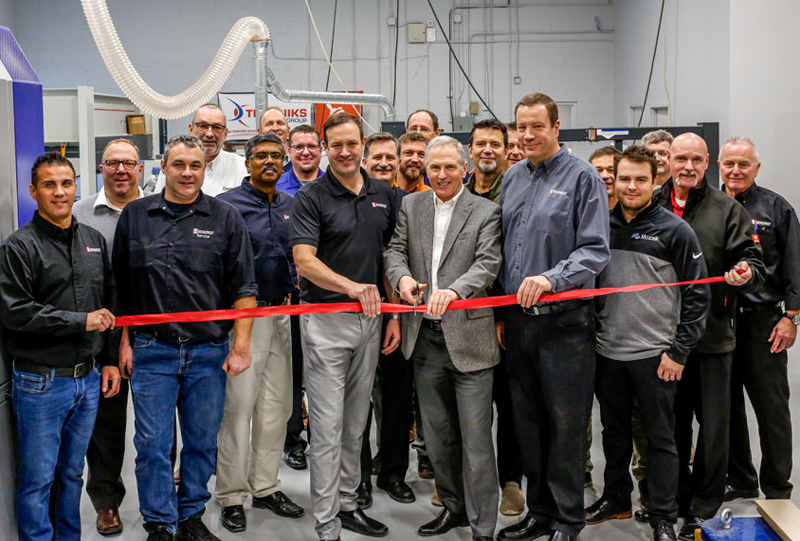 “Our investment in a new larger facility in Mississauga allows us to properly showcase our wide range of panel processing and solid wood processing equipment solutions,” said Ryan Akhurst, vice president. One of the latest product offerings on display was the new Belfab RG interior enclosed dust collection system. The RG Series from Belfab is an enclosed type modular dust collector equipped with a continuous pulse jet cleaning system with capacities ranging from 1,500 to 5,000 CFM. Its design meets the most stringent North-American safety regulations for an indoor installation by incorporating flameless venting and a fire extinguishing system as a standard. The unit’s fan is equipped with a variable speed drive, which controls the airflow while maximizing energy efficiency. An HMI (Human Machine Interface) monitors airflow performance and maintains optimal filter efficiency. 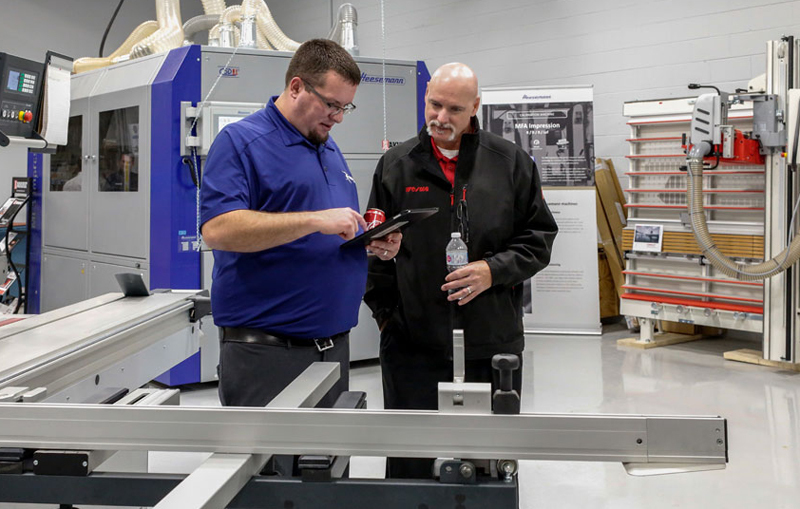 Live CNC software demonstrations were held with experts from Mozaik and Alphacam where customers could design their own cabinets and components, and send them to the showroom floor to be machined. Akhurst Machinery was first established in 1938 and just celebrated 80 years in business. In addition to their facility in Mississauga, Akhurst has branch locations in Delta B.C., Edmonton Alta., Montreal Que., and Dieppe N.B.